Andres Felipe Deik, M.D., M.S.Ed. Universidad del Norte, Barranquilla, Colombia, 2005. Intern in Internal Medicine, Albert Einstein College of Medicine, Beth Israel Medical Center, New York, NY, 2007-2008. Neurology Resident, Albert Einstein College of Medicine, Beth Israel Medical Center, New York, NY, 2008-2011. 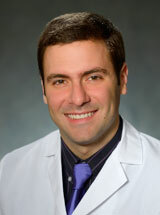 Chief Resident in Neurology, Albert Einstein College of Medicine, Beth Israel Medical Center, New York, NY, 2010-2011. Movement Disorders Fellow, Albert Einstein College of Medicine, Beth Israel Medical Center, New York, NY, 2011-2013. American Board of Psychiatry and Neurology, Neurology Certification, 2011. Movement Disorders Specialist with interest in dystonia. Expert in the administration of botulinum toxin injections and deep brain stimulation programming. Master in Medical Education. Associate Program Director of the Movement Disorders Fellowship at the University of Pennsylvania's Parkinson's Disease and Movement Disorders Center. Site principal investigator for clinical trials in Movement Disorders. Pahwa R, Isaacson S, Jimenez-Shaheed J, Malaty I, Deik A, Johnson R, Patni R: Impact of dyskinesia on activities of daily living in Parkinson's disease: Results from pooled phase 3 ADS-5102 clinical trials. Parkinsonism & related disorders Sep 2018. Pullman M, Ortega R, Glickman A, Deik A, Raymond D, Marder K, Giladi N, Bressman S, Hagenah J, Bruggemann N, Saunders-Pullman R: Increased substantia nigra echogenicity in LRRK2 family members without mutations. Movement disorders : official journal of the Movement Disorder Society 33(9): 1504-1505, Aug 2018 Notes: doi: 10.1002/mds.27443. Coughlin D, Bardakjian T, Spindler M, Deik A: Hereditary Myoclonus Dystonia: A Novel Variant and Phenotype Including Intellectual Disability. Tremor and other hyperkinetic movements (New York, N.Y.) 8: 547, 2018. Sarva H, Miravite J, Swan M, Deik A, Raymond D, Severt W, Kopell B: A Case of Myoclonus-Dystonia Responding to Low-frequency Pallidal Stimulation. Tremor and other hyperkinetic movements (New York, N.Y.) 7: 460, May 2017. Swan M, Doan N, Ortega R, Barrett M, Nichols W, Ozelius L, Soto-Valencia J, Boschung S, Deik A, Sarva H, Cabassa J, Johannes B, Raymond D, Marder K, Giladi N, Miravite J, Severt W, Sachdev R, Shanker V, Bressman S, Saunders-Pullman R: Neuropsychiatric characteristics of GBA-associated Parkinson disease. Journal of the neurological sciences 370: 63-69, Nov 2016. Loaiza-Bonilla A, Jensen C, Shroff S, Furth E, Bonilla-Reyes P, Deik A, Morrissette J: KDR Mutation as a Novel Predictive Biomarker of Exceptional Response to Regorafenib in Metastatic Colorectal Cancer. Cureus 8(2): e478, Feb 2016. Miravite J, Deik A, Swan M, Sarva H, Kopell B, Severt W: Parkinsonism and dystonia in Lubag disease respond well to high pulse width/low-frequency globus pallidus interna DBS. Neurology. Clinical practice 5(6): 480-483, Dec 2015. Sarva H, Deik A, Swan M, Severt W: Freezing of gait after a hemorrhagic stroke can respond to venlafaxine and rivastigmine. Neurology. Clinical practice 5(3): 267-269, Jun 2015. Deik A, Johannes B, Rucker J, Brodie S, Deegan E, Landy K, Scelsa S, Saunders-Pullman R, Paisan-Ruiz C: Compound heterozygous PNPLA6 mutations cause Boucher-Neuhäuser syndrome with late-onset ataxia. Journal of Neurology 261(12): 2411-23, Dec 2014 Notes: doi: 10.1007/s00415-014-7516-3. Epub 2014 Sep 30. Saunders-Pullman R, Fuchs T, San Luciano M, Raymond D, Brashear A, Ortega R, Deik A, Ozelius L, Bressman S: Heterogeneity in primary dystonia: lessons from THAP1, GNAL, and TOR1A in Amish-Mennonites. Movement disorders : official journal of the Movement Disorder Society 29(6): 812-8, May 2014.